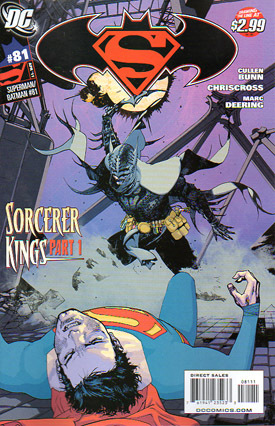 "Sorcerer Kings - Part 1"
Laura, Ragman and Blue Devil, members of the group known as the Shadowpact, are on a mission from the Phantom Stranger to be on the lookout for a magical catastrophe of Biblical proportions. Suddenly a fight between an armored man and a hoard of demons materializes before them and in the end the armored man is killed. After fighting the demons off Blue Devil and the others are shocked to discover that the dead man is Superman. Meanwhile in the "Batcave" "Batman" and a woman called Nina talk about "Clark" leaving despite all of their discussions not to. Elsewhere the Phantom Stranger contacts a very much alive Superman and brings him to the Oblivion Bar to examine the body of the other Superman. Before they can find out anything "Batman" and Nina arrive and after a quick battle kidnap Superman. Later Detective Chimp contacts the Dark Knight and tells him about Superman's disappearance. Meanwhile, Superman wakes up and assumes that he is on a parallel world. "Batman" is quick to point out that it isn't a parallel world; it is Superman's future. Story - 3: I really didn't care for this issue at all. It's not that it was bad because the writing was really solid. It even had the Shadowpact, a group that I have a lot of affection for. The problem is that I just don't care about the story or at least I don't care about this first chapter of the story, which is bad because this is the chapter that is supposed to grab me and not let go. There was action and some excitement but I just wasn't feeling it. The whole, "Something really bad happened in the future," thing is a bit played out for me at this point. I wish there was more to write about. I wish I liked the future Batman and his demon sidekick. I wish I got more out of the seeing Detective Chimp, who is an awesome character. Even Blue Devil's appearance didn't hold much sway for me. Maybe the next issue will be better and things will pick up. For the moment I am just not buying into what Cullen Bunn is selling. He's not a bad writer by any means. I just didn't care for the story he has started telling in this issue. Art - 4: While this story was not my cup of tea I did enjoy the art. ChrisCross (a name that gives the spell-check on Microsoft Word all kinds of fits) has a good handle on the magical characters and the action of the story. I didn't much like his Superman, though. He looks... old, I guess. I don't really care for it at all. Still, the Shadowpact looked kind of cool. Cover Art - 1: I am not the biggest fan of this cover. It just doesn't appeal to me, mostly because I don't like the future Batman's design. Superman looks a little awkward as well.